The two-week-old, fast-casual concept from Anthony Carron (800 Degrees), Noah Ellis (Red Medicine), Steven Fretz (XIV) and Jamie Tiampo (dell’anima, NYC) is serving up pretty fantastic sandwiches – ones I didn’t even know I missed. The Midwest leanings all over the menu made me nostalgic for a reimagined history of Arby’s, a place that my family would often frequent as an afternoon reward after church. I guiltfully enjoyed their cheese sauce, coined “Wizz,” and the menu’s integration of Provel transported me to St. Louis. Special buns varying from Sea Salt to Onion and Sesame serve a great framework to thin, wide ribbons of super lean roast beef folded in between. Round Sauce and Horseradish Cream, super welcome stand-ins for Arby’s and Horsey sauces, are available at the pump. Love that Horse & Hole sandwich, with Provel, Horseradish cream, roasted mushrooms and of course, beef, on that sesame bun. And then there are the fries. 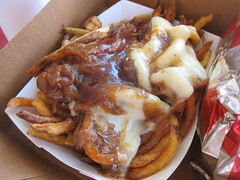 Go for the “Dirty” Fries for ultimate indulgence, topped with gravy, Provel, carmelized onions and Round Sauce. The Curly Fries are top-notch – not too thick, seasoned well and fried in 100% beef fat, lest you question their passion for beef-everything – and are available to substitute for the frites should you choose. 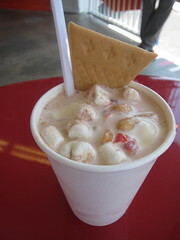 As for dessert, Top Round has a way of manipulating what they call custard into different formats, including Sundaes and Concretes, shakes, floats and malts. It’s served from a soft-serve, so I myself have a hard time calling it frozen custard (defined so during my early days at Kopp’s and Culver’s outposts in Wisconsin), but it doesn’t mean that these desserts aren’t wholly delicious. While you can choose your own dessert ingredients, the dozen combinations listed on the menu shouldn’t be overlooked. I loved the Blueberry Pie, with Nilla Wafers serving as the crust component. Off-menu: Get the strawberry-pistachio swirled milkshake. It’s a wonderful combination and not listed on the menu. I plan on getting this every visit; it’s that delicious. Finally, its place at an old donut shop makes for a shell fully suitable for throw-back purposes, and I loved what they did with the design. 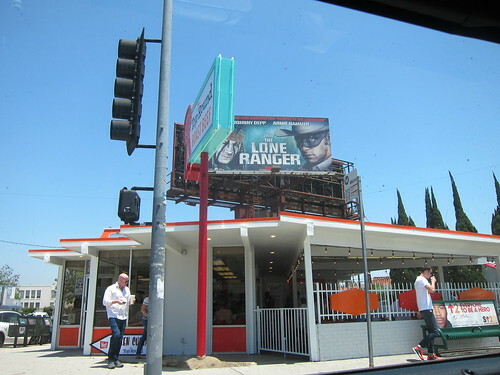 The Mid-Wilshire location is advantageous with the dearth of affordable yet quality places to eat during business the daytime. 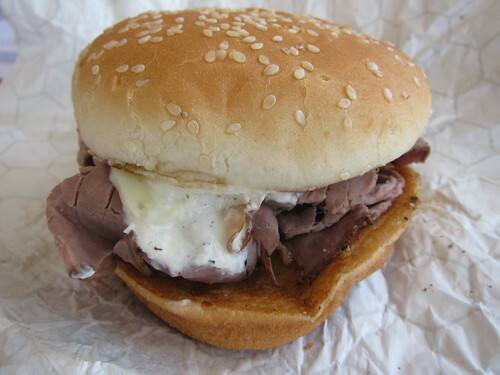 At $5.00 – $6.50 per delicious roast beef sandwich, it’s pretty much a win-win. This entry was posted in Dessert, Food, L.A. and tagged Anthony Carron, Carthay Circle, casual, Concretes, Eat roast beef, float, frozen custard, Jamie Tiampo, la brea, malts, Mid-Wilshire, milkshake, Noah Ellis, Olympic, roast beef, sandwiches, shakes, Steven Fretz, Top Round. Bookmark the permalink.